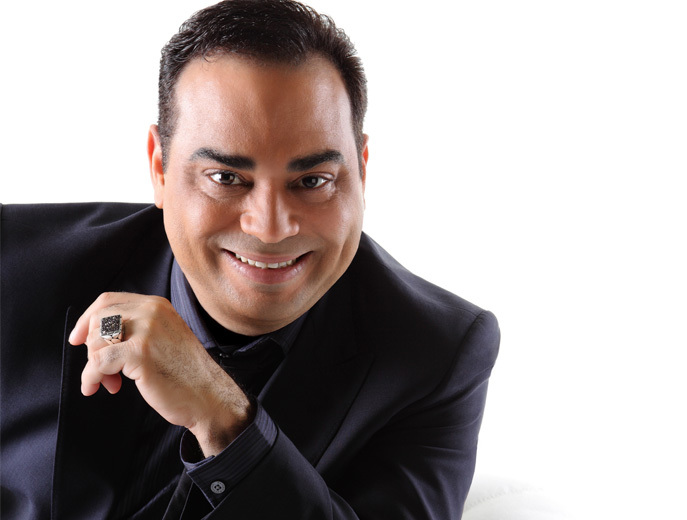 Gilberto Santa Rosa, also known as “El Caballero de la Salsa” (The Gentleman of Salsa), is a Puerto Rican bandleader and singer of salsa and bolero. During the 1980s, he recorded “Homenaje a Eddie Palmieri” (Tribute to Eddie Palmieri) with the Puerto Rican All Stars. He also recorded with various orchestras, amongst them the Tommy Olivencia Orchestra, and the Willie Rosario orchestra. Santa Rosa developed a unique style of “soneo” (improvisation) in salsa that permitted him to be successful in both the “tropical” and “romantic” styles of the music. In 1986, Santa Rosa formed his own band and signed with Combo Records; a string of hits followed, such as “Good Vibrations”, “De amor y salsa” (Of Love and Salsa), “Punto de vista” (Point of View), “Vivir sin ella” (Living without Her) and “Perspectiva”. Santa Rosa was also the first singer of tropical salsa to carry out a concert at the Carnegie Hall Theater, in New York City, where he performed as the opening number, his unique version of the salsa tune, “Represento” (I Represent), composed by Lou Briel. This event was recorded live at the hall, and later released as an album. A highlight of the night was the four-minute unscripted addition he made to his song “Perdoname” (Forgive Me), which solidified his improvisational talent. This live version became such a sensation thereafter that Santa Rosa had to memorize his own improvised lines for future concerts, and Perdoname became the closing song to his shows. In 1990, Santa Rosa joined the all star “La Puertorriqueña” project which included Andy Montañez; in the same year he was awarded the Billboard Lo Nuestro Award for Best Male Singer. He also participated in the play “La pareja dispareja” (The Odd Couple) alongside Luis Vigoreaux and Rafo Muñiz. In 1995, Santa Rosa traveled to Japan as Puerto Rico’s Good Will Ambassador, where he sang “De cara al viento” (Facing the Wind) in Japanese. In 1996, the greatest hits album “Caballero de la Salsa, Vol 2” was released and he also participated in the First “Festival Presidente” in the Dominican Republic (a Latin music festival sponsored by local Presidente beer). In 1997, he sang with Andy Montañez in New York Citys Lincoln Center and later that year, with Olga Tañón at the Universal Studios Amphitheater in Hollywood, California. Santa Rosa’s hits continued with the album “Expresión” which included the single “Fulana” (What’s her name) and in 2001 with the album “Romántico”. He released “Viceversa” in 2002 which became a “hit” in the Latin community in the United States and in all of Latin-America. Santa Rosa has taken on himself the task of keeping Tito Rodríguez’s musical legacy alive and has acquired much of Tito’s memorabilia, including articles of clothing, music and furniture from his home in Puerto Rico. Santa Rosa has staged several concerts and dances honoring the late singer, and recorded an album of his where with the use of modern technology, he sings “En la soledad” (In Solitude), composed by Puchi Balseiro in a duet with him. During the week of February 24, 2003 Santa Rosa organized a two-night concert at the Center of the Performing Arts in Caguas, Puerto Rico. As an introduction to the event, he arranged for his private collection of Tito Rodríguez memorabilia to be exhibited in the lobby of the center. In 2004, he released “Auténtico”. In addition, he has long played an important role in the career of his friend and protégé, Víctor Manuelle, who Santa Rosa discovered. The two released a joint live album late in 2005, “Dos soneros, una historia.” In 2006, he released, “Directo al corazón”, and in 2007 he carried out a concert acknowledged by the critics, in Plaza Colón at Santo Domingo and released Contraste with Conteo regresivo being a major album hit. Furthermore, he performs alongside Chucho Avellanet, a musical comedy club-act called, Cantando y Contando, (Singing & Telling Stories), throughout the island.